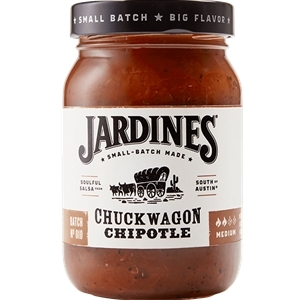 If you're craving the richest, most flavorful chipotle salsa around, look no further than Jardines Chuckwagon Chipotle Salsa. Twist open Chuckwagon Chipotle Salsa, and you'll be amazed by its fresh smoky, mouthwatering aroma. As for taste, well that's what it's all about . Fresh vegetables and peppers are slowly fire-roasted to perfection, then bottled quickly, so we capture every drop of mouthwatering smoky flavor. Jardine's Chuckwagon Chipotle Salsa is one of our favorites for chips and grilled meats, and it'll be one of yours, too. 16oz. * Formerly known as Jardines 7J Ranch Chipotle Salsa. Tomatoes, roasted tomatoes, roasted jalapeno peppers, chipotle peppers (chipotle peppers, water, tomato paste, salt, sugar, onion, vinegar), water, salt, roasted onion, vinegar, sesame oil, roasted garlic, carrots, granulated onions, lime concentrate, spices, hickory flavor and granulated cilantro.